I got up at 5AM this morning after working until 11PM last night. Why so early? I had to drive to Allen's house by 6AM for a one day road trip to WPPI with him and Brian. Needless to say, the traffic was still horrible at this awful hour. There was a fatality at the exit I'm supposed to get off to Allen's house. Anyway, I was 30 minutes late and Brian was wondering where the heck were we? We promptly drove as fast as possible to Brian's house after getting coffee for Allen. We finally took off around 7AM from Brian's house which is only about 2 1/2 hours to Vegas. After breakfast at Barstow, Brian's Volvo blew out the front right tire tearing up the entire tire, wheelwell, and his signal light. It was pretty strange that we didn't hear a loud pop at all. 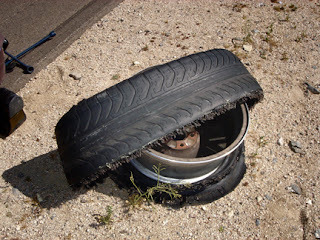 The reason is that his tires were so worned out that it had no tread and it was ready to go at any time. We finally arrived to Las Vegas with his baby spare tire going at 60mph. A very nice gentleman by the name of TC who works for the NV Sheriff's Dept. kindly offer us a ride to Bally's from the tire place because it would take 2 hours to fix 2 tires. On the way, we discussed about having children and how you can't own anything nice any more. He drove us in a once nice/new limited edition 4 Runner but his kids trashed his truck. We offered to pay him for troubling him to drive us to Bally's but he refused. He wins the Good Samaritan Award in my book. Thanks TC!